Wicked Good Travel Tips / Destinations / Europe Travel Tips / England/UK Travel Tips / Plan A Family Vacation To London And Find Paddington Bear All Over Town! It’s a great year for a family vacation in London. Excitement is building in anticipation of the children’s film, Paddington, due to be released in the U.S. in mid-December and late November in the UK. The movie features the adventures of lovable bear, Paddington Brown, a storybook bear who has been entertaining young children (in book form) for over 50 years. London (Paddington’s hometown) is pulling out all the stops to welcome families to London andhonor the nation’s most beloved bear. 50 specially outfitted Paddington Bear statues will dot the city, appearing in strategic spots where Paddington encountered his most memorable adventures. Families will be able to follow specially designed Paddington Trails to follow the lovable bear all over the city. A host of celebrities and artists have been tasked with designing their own personal Paddington Bears including Nicole Kidman, Hugh Bonneville, David Beckham, Bear Grylls and Michael Sheen to name a few. You’ll find Michael Sheen’s Paddington “Shakesbear” just outside of the Shakespeare Globe Theatre, all decked out in his traditional Shakespearean costume. 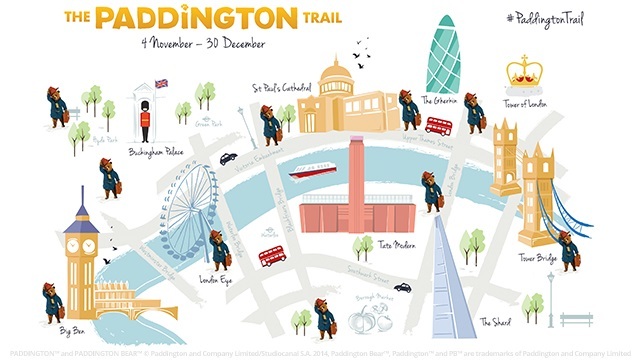 From November 4th through December 30, 2014, families can wind their way through London on one of the Paddington Trails to discover their favorite bear all painted up and decked out for the occasion. Paddington Bear makes a wonderful ambassador to spark children’s interest in travel. As the story goes, Paddington was adopted by the Brown family after being found all by himself at Paddington Station with a tag on his coat that read, “Please Look After This Bear. Thank You.” He had traveled to London from “deepest, darkest Peru” where he had been raised by his Aunt Lucy. His story is filled with many humorous adventures as he attempts to understand and adapt to life in a big city. During the Paddington promotion, there will be an online auction and later a live auction to sell the special Paddington Bears for the benefit of the National Society For The Prevention of Cruelty to Children. Families on vacation will also find special Paddington Trail bears and limited edition gifts for sale at Selfridges on Oxford Street, for the benefits of children’s charities. Selfridges played a pivotal role in the creation of the Paddington stories, as author Michael Bond purchased a small bear at Selfridges on Christmas Eve in 1956 for his wife and named the bear after the nearby Paddington Station. This bear, coupled with the tales of young children sent to England during the war with only a tag on their coat asking for care, inspired Mr. Bond to write the Paddington stories. So bring the whole family to London this holiday season. Your children will fall in love with all the imaginative Paddington Bears, and they may just possibly learn to love marmalade as much as Paddington does! You can find all the details about Paddington Trails and promotions at VisitLondon.com/Paddington.